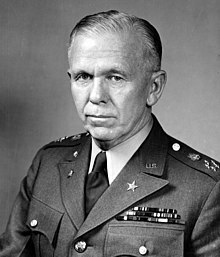 George Marshall, Sekretaris Negara Amerika Serikat. Rencana Marshall atau Marshall Plan adalah program ekonomi skala besar pada tahun 1947 - 1951 oleh Amerika Serikat yang bertujuan membangun kembali kekuatan ekonomi negara - negara di Eropa setelah Perang Dunia II usai. Inisiatif penamaan diambil dari sekretaris negara George Marshall. Pembagian bantuan Rencana Marshall ini tidak hanya untuk negara - negara Eropa namun juga negara Asia yang terkena imbas dari Perang Dunia II. ^ The Marshall Plan was replaced by the Mutual Security Plan at the end of 1951. Mills, Nicolaus (2008). Winning the peace: the Marshall Plan and America's coming of age as a superpower. Wiley. hlm. 195. ISBN 978-0-470-09755-7. ^ The name was due to President Harry S. Truman's suspicion that the Republican Party would oppose anything proposed by himself, a Democrat, and his administration I said, "Mr. President, this is one of the great decisions of your administration, and it may be the first time in the history of the world one of the great wealthy nations had reached out and helped a number of others that needed help at the time, with no hope of aggrandizement, no hope of additional territory, doing it as a humane act." [He said, "I agree to all that." So I said, "I'd hope your name would be connected with this plan." He said, "No. No, Clark. If this goes up as a Truman product, it'll lie up there for a day or two and then turn belly up and die." He said, "The Republicans are not going to pass anything that's called the Truman something." Arkes, Hadley. Bureaucracy, the Marshall Plan, and the National Interest (1972). Fossedal, Gregory A. Our Finest Hour: Will Clayton, the Marshall Plan, and the Triumph of Democracy. (1993). Mee, Charles L. The Marshall Plan: The Launching of the Pax Americana (1984). Milward, Alan S. The Reconstruction of Western Europe, 1945–51. (1984). Röpke, Wilhelm, Humane Economist, "Biography of Wilhelm Röpke (1899-1966): Humane Economist". Mises.org. Diakses tanggal 2009-08-18. Wikimedia Commons memiliki media mengenai Rencana Marshall. United States Secretary of State James F. Byrnes famous Stuttgart speech, September 6, 1946 The speech marked the turning point away from the Morgenthau Plan philosophy of economic dismantlement of Germany and towards a policy of economic reconstruction. U.S. Economic Policy Towards defeated countries April, 1946. Luis García Berlanga's critique of the Marshall Plan in a classic Spanish film: Welcome Mr. Marshall! Halaman ini terakhir diubah pada 30 November 2017, pukul 04.33.